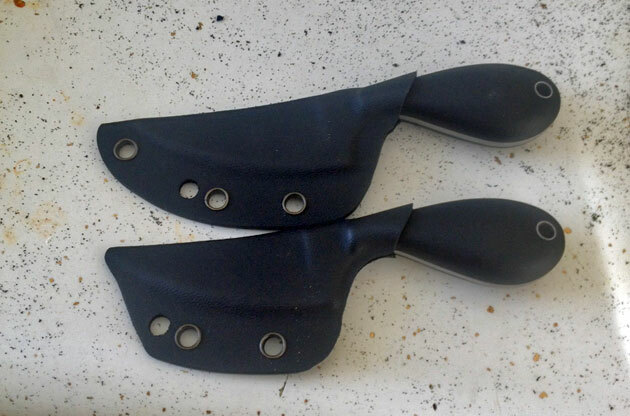 Most of the small fixed blades (SFBs) on the market today are designed pretty much the same. Usually these knives are multi-purpose designed tools that can be used for everything from rope cutting to self-defense. 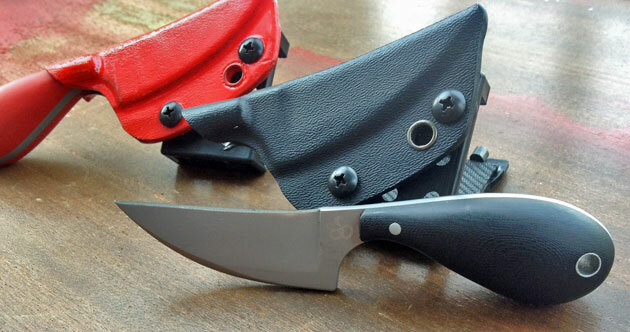 What you don’t see a lot of are small fixed blades designed primarily as self-defense tools. This is where the Clinch Pick by ShivWorks shows its true beauty – an extremely lethal implement, contained in a small and concealable package. Unlike most SFBs the Clinch Pick is designed with a reverse edge which will rip and tear what it comes into contact with. It’s also predominately developed to be worn forward of the hip line with the â€œhiltâ€ (grip) pointing at a 45 degree, downward angle. This is the newest generation of Clinch Pick and the first that were manufactured overseas. The Clinch Pick was originally developed and went into production over 10 years ago with a custom knife maker. Soon after, production ceased and trying to find a Clinch PickÂ for sale was the equivalent to finding the infamous unicorn, and if you did they were outrageously expensive. With these newest Clinch Picks the buyer can have one of these knives at an affordable price that wonâ€™t break the bank and doesn’t skimp on quality. A lot of thought was put in to the Clinch Pickâ€™s design, but would you expect anything less with someone like Craig Douglas (SouthNarc) involved? The Clinch Pick is a reverse edge, Small Fixed Blade that is primarily designed to be worn forward of the hips and be drawn via the user’s primary hand in a forward grip/edge in (FGEI), locked wrist configuration. In this format, the user can access the Clinch Pick with limited arm/hand mobility while entangled with an attacker and get the blade immediately into the fight. For most people familiar with Filipino Martial Arts (FMA), this goes against what is mostly taught when it comes to using full mobility of your wrist while having the edge of the blade project outwards from you. When talking in the context of a violent and possibly lethal ambush where you may not have the advantage of space and distance, having a reverse edge tool that can easily rip and tear targets of opportunity on your attacker is much more efficient. By using the Clinch Pick as a point driven tool and by noting the edge orientation as a secondary quality, the Clinch Pick can be utilized as a human Singer Sewing Machine. Just as with a firearm, the more holes you have in the attacker the better. As mentioned previously, the actual blade on the Clinch PickÂ is extremely distinct due to its self-defense nature. Holding it in the FGEI format as it was designed, the predominately flat edge of the knife will be facing the user. The dull edge of the blade, opposite the cutting edge, widens near the hilt and narrows towards the point. There is also a comfortably designed â€œchoilâ€ that wraps nicely around the index finger. Smoothing it all out is the subdued ShivWorks logo on the left side of the blade. 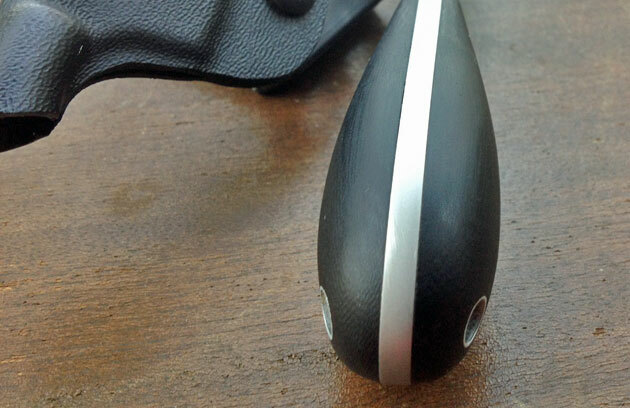 The hilt on the Clinch Pick is uniquely designed to give the user an overall extremely small envelope. Its distinct bulbous, egg-shaped grip will fit perfectly in the users hand and will not extend out, even with small hands. The original design that Craig received when this re-release of the Clinch PickÂ was first produced had a handle that wasn’t up to â€œstandards.â€ The â€œeggâ€ just wasn’t the right size so Craig had to get back in contact with the manufacturer before they started mass-producing them. 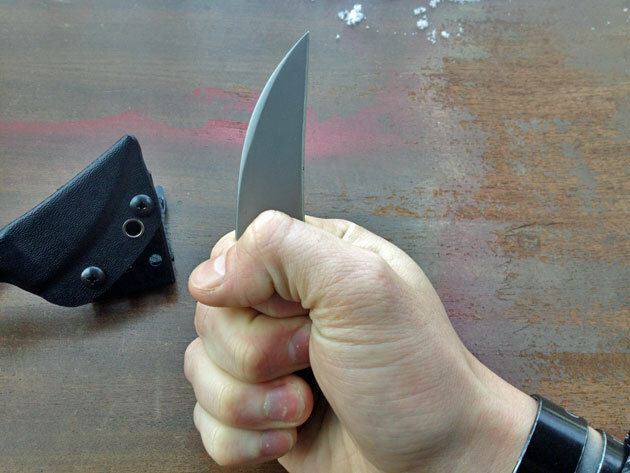 The only downside to this craftily designed SFB is the provided kydex sheath. Unfortunately they were over-molded a bit in production, which ended up with them having extra material where the user gets their initial grip. Due to this issue, I highly recommend that the user end up shaving off some material via a Dremel tool or an equivalent. As you can see by the pictures there is also extra material near the tip of the sheath that can be taken off as well if the user desires. With the provided Tek-Lok attachment it integrates perfectly with the sheath. The only thing that I did to modify mine is purchase a mouse pad from an office supply store and used the â€œgrippyâ€ side to glue to one side of the Tek-Lok. This negates any movement that the user may encounter when deploying/sheathing the Clinch Pick. Also, my preference is to instantly visually know the difference between the â€œliveâ€ Clinch PickÂ and the trainer. 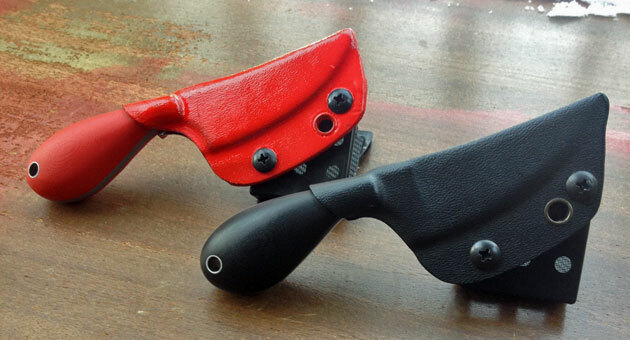 Therefore I took the extra time to grab some basic spray paint and color my trainer sheath red to match the red handle. The ShivWorks Clinch Pick is a distinctively engineered blade and great purchase for someone that understands the purpose of utilizing an edged weapon in a self-defense context. From its uniquely designed edge orientation to its overall compact frame, the Clinch Picks stands out from any other Small Fixed Blade. Even though it may take a little personal craftsmanship to finalize the sheath for efficient drawing, itâ€™s a menial con compared to the overall benefit of the carry and employment of the knife. Craig has spent a lot of time developing the Clinch Pick from its original design all the way back in 2003. What you see in the current iteration is a quality, readily available, affordable and specifically designed defensive tool that is easily worn and accessed. Depending on your state laws, Iâ€™d highly recommend picking up the â€œliveâ€ Clinch PickÂ and trainer set so you can safely practice accessing your trainer in force-on-force drills.Â Unfortunately, the Clinch Pick cannot be purchased at the ShivWorks website. The Clinch Pick can be purchased for $80 by emailing Will Hernandez atÂ ccdefense@gmail.com. Overall, knowing how to utilize a purpose built edged weapon in the context of personal protection is extremely vital when you are unable to access your firearm or a firearm is not immediately available. Looks like a very good product, although someone should tell Shivworks that their website needs some serious help. Their product page has no products listed. The website for the dealer they identify ccdefense.com times out. Very frustrating. None of that is Monderno’s fault, of course, but if the Shivworks folks look in here, perhaps they might explain themselves. 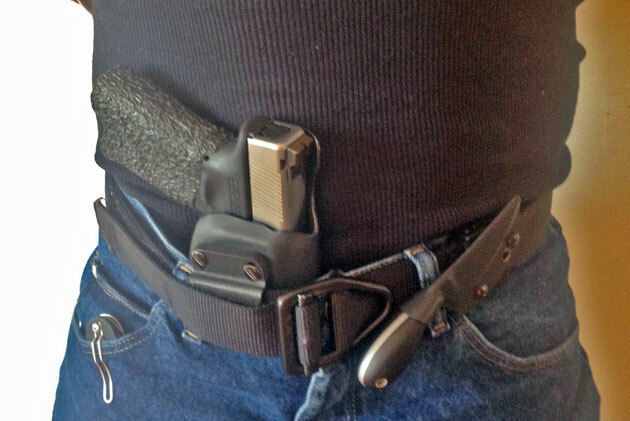 Psydr, it’s a “Keepers Appendix Holster” by Keepers Concealment. There’s plenty of reviews out there about his rig. I’ve tried literally every form of appendix holster, and this is the only one I swear by when I don’t have to wear a suit!! Good article, but the CP was NOT designed to be held FGEI, but RGEI. The video linked on Moderno for the P’Kal that the screenshot was used from confirms this since the P’Kal is essentially a folding CP. Mark, actually the CP WAS designed to be held FGEI, the P’Kal (essentially a folding Disciple) was designed to be held RGEI.